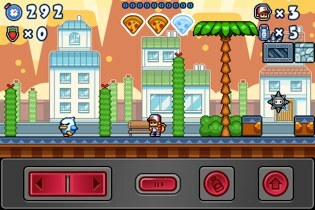 When I saw Pizza Boy, I instantly had to think about Alex Kidd. 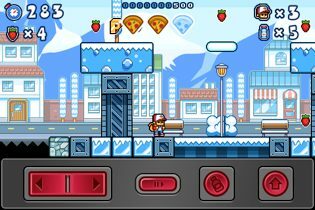 The look of Pizza Boy seems to be highly inspired by this SEGA classic. But it’s not only the look that will remind you of similar old-school platformers, you will most likely think the same of the gameplay. And in Pizza Boys case, that’s a complement. Let’s talk about the most important aspect of a 2d platformer first, the controls. I’ll keep it short: The controls are amongst the very best that’s available for the iPhone and iPod. I am still astonished of just how directly I felt to be in control of the character. 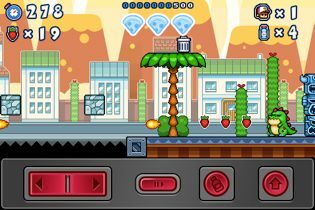 The game comes with 4 buttons: left/right, jump and throw. Throwing is for the milk bottles that you can collect on the way. You can use them to get rid of enemies that cross your way and to destroy special stone blocks that block the way to special goodies. The gameplay won’t surprise you in any way, but the level design and enemy placement is very clever and will become quite challenging as you progress. You will jump from platform to platform, avoid dogs, penguins and birds that try to attack you and collect some stuff on your way to the end of each of the 12 levels. You will start with 3 pizza slices that represent your health bar. 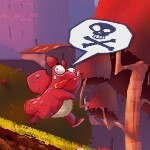 If you lose one of them you can collect some slices in the levels. Once you lose all, you lose a live. If you lose a live you have to start from the very beginning of each level, which can be a bit frustrating on one hand, but is also one more aspect that makes this game feel so old-school and challenging. There are 5 things to collect: The pizza slices I already mentioned to boost your health bar, strawberries that will give you an extra live for every 100 you grab, an actual extra live, a cat wants to be saved which will give you bonus points and the 5 letters of the word pizza that will also give you some bonus points. Those are placed in some pretty tricky spots, so collecting all of them will be quite a challenge. The graphics are nice to look at with a lot of retro charm – but don’t expect anything impressive from a technical point of view. 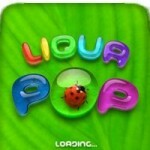 However, this makes the game run very smooth even on an older iPhone or iPod. The only negative thing I have to mention is the length of Pizza Boy. It comes with 3 scenarios that have 4 levels each and you will have seen all of them sooner than you would want to. Replay value is not that high, but I did enjoy to go back to the levels and collect all the pizza letters I have missed on my first way through. 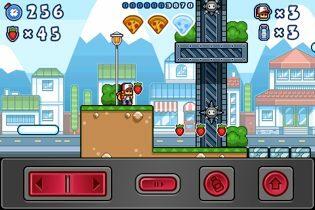 If all this talk about retro platformers made you feel all warm around your heart, I can only recommend to download Pizza Boy. Unfortunately there is no lite version available, so you will have to jump into the cold water with this one. It’s available for $1,99. Tekken Bowl Quick Look: It's Free, So What?